The winners will be announced through Twitter. Follow us @DirJournal. UPDATED 19th December 2016: The coupon DJCONTEST16 now offers a whopping 40% OFF instead of 20%. We’re giving you a chance to win some great prizes in our December Submission contest. 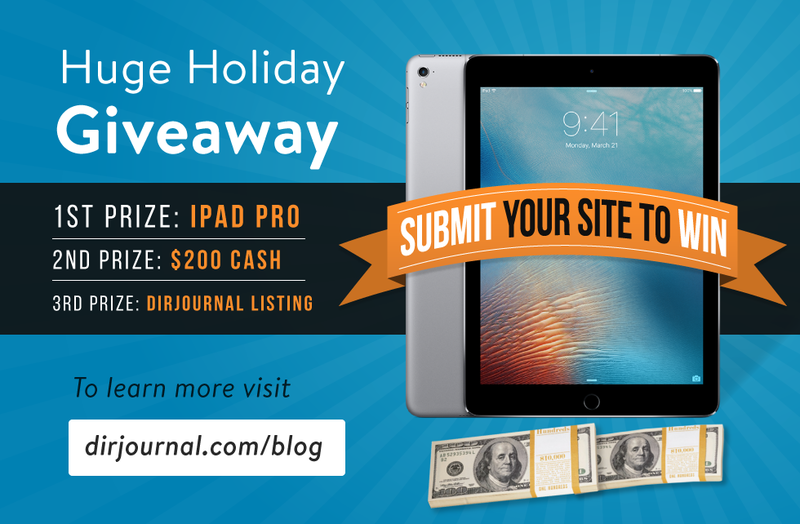 You can win an iPad Pro (9.7 inch, Wi-fi, 32 GB), $200 cash, and more. Find out more below, and enter our contest today! * The cash value of a new iPad Pro may be substituted for an actual iPad Pro at the discretion of DirJournal.com staff, depending on things like the winner’s location. Cash value prizes require a PayPal account in order for the winners to claim their prize. If the grand prize winner doesn’t want the iPad for any reason, they can also request a cash value prize (but they must also have a PayPal account). The cash value for the iPad prize will be considered $599. On December 27th, 2016, we’ll choose 5 winners at random from all qualifying submissions. To keep things fair, we’ll run all eligible entries through Random.org. To avoid any bias, no one will manually choose the winners. Winners will be announced on December 28th 2016 on Twitter, and winners will be contacted via Email for more information about collecting their prizes. You will be entered into the contest once per directory submission. So if you submit multiple listings, you can increase your number of entries (and your chance to win). Visit DirJournal.com and start submitting NOW!